"Are we in danger of condemning our Children to lives of abject misery?" In December 2012, the UK Government lifted the moratorium on the process known as Hydraulic Fracturing (FRACKING), pronouncing that the UK would be at the 'heart of the Shale Gas revolution'. Ian R Crane worked in the Oilfield Services Industry for 20 years (1979-98). Today he is on a mission; a mission to ensure that the British public are made aware of the abomination that is about to be unleashed on their 'Green & Pleasant Land'. Former oilfield executive Ian R Crane has engaged industry sources and independent researchers to lay the foundations for his investigations into fracking -- mining of shale and coal seam gas. In "Fractured Future -- It doesn't have to be this way", a nationwide speaking tour, Ian asks whether this 'miracle' of nature really will be the solution to our nation's problems? Is it going to be the best thing for us since North Sea gas, or are there hidden dangers which could impact upon communities in ways which need open discussion? Our national debt has risen by 4%, from 82% to 86% of our Gross Domestic Product, despite all the austerity measures put in place -- creating a Trillion Dollar Debt. As experts will tell you, once it goes beyond 100% (where UK debt will be more than annual turnover) our problems will escalate. 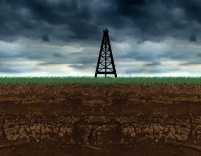 Is fracking a short-term gain for a long-term loss? A credit crunch turned into an environmental crunch, while bankers' bonuses continue to escalate?